Title : High resolution phased-array inspection of bonded joints in windmill blades. Using epoxy adhesives to joint fiberglass composite (GFRP) parts is a common practice to build larger components. It is the case of windmill blades, where structural strips are bonded to the blade inner surface, both manufactured with GRFP. Structural resistance of the blade depends on these joints quality, and hence, non destructive evaluation is mandatory to guarantee component life. Non destructive evaluation of GFRP using ultrasound is a challenging task. Microstructure of fiberglass and resin composites introduces dispersive effects on ultrasound waves, which is seen as grain noise and produces high attenuation to ultrasonic signals. The traditional approach to overcome these problems is using low frequency transducers (typically 500 kHz), at the expense of loosing resolution, and hence, the capability to detect small defects or to inspect low thickness components. In this work, results from the inspection of a strip bonded joint of a windmill blade using phased-array are presented. It is demonstrated how this method provides high resolution images at the same time inspection time is greatly reduced. 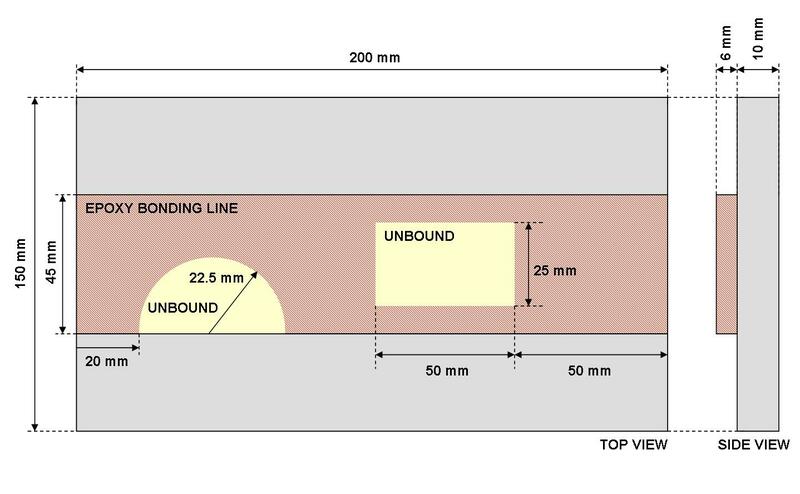 Figure 1 depicts a diagram of the used test block. It is made by two layers of GRFP bonded with epoxy adhesive, which emulates the joint between a structural strip and the blade inner surface. Adhesive lack defects are simulated by balsa wood inclusions into the bonded joint. A phased array with 128 elements, inter-element pitch of 0.5mm and 5 MHz was used, in contact with the flat surface of the inspected part. Figure 2 shows the inspection scheme. Phased-array electronic scan capability avoids mechanical movement of the transducer in the direction perpendicular to the bonded line, which greatly reduces the inspection time and complexity compared with a single-element transducer. A SITAU-311 equipment was used, with 32 channels multiplexed to 128 array elements, and linear B-Scans at 0º were performed. 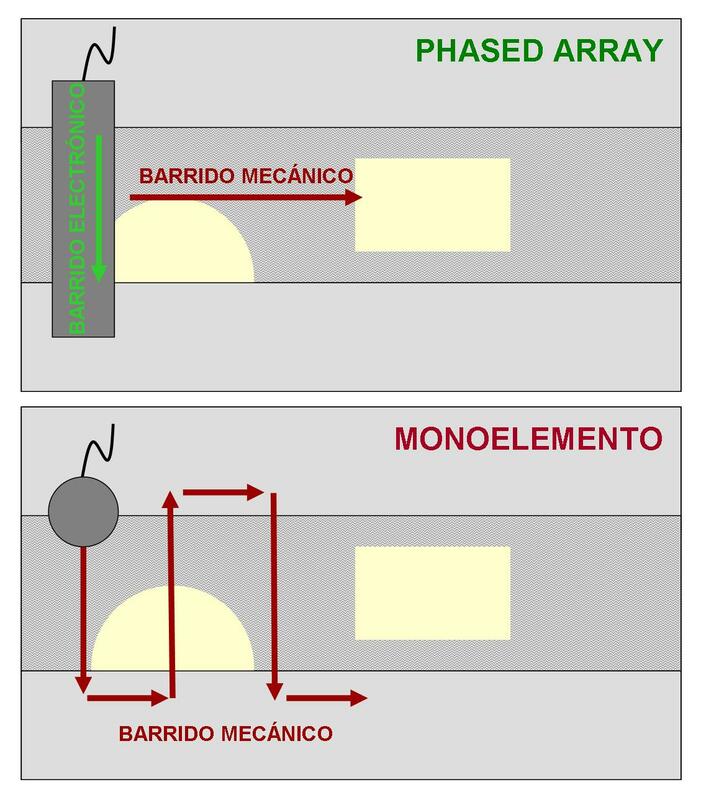 Figure 2 – Phased-array inspection scheme and comparison with a single-element scan. When both components are correctly bonded, the interface between GFRP and epoxy-adhesive does not generate a significant echo, because both materials have similar acoustic impedance. However, adhesive lack defects introduce a GFRP-Air or Epoxy-Air interface, and hence, echo amplitude increases. 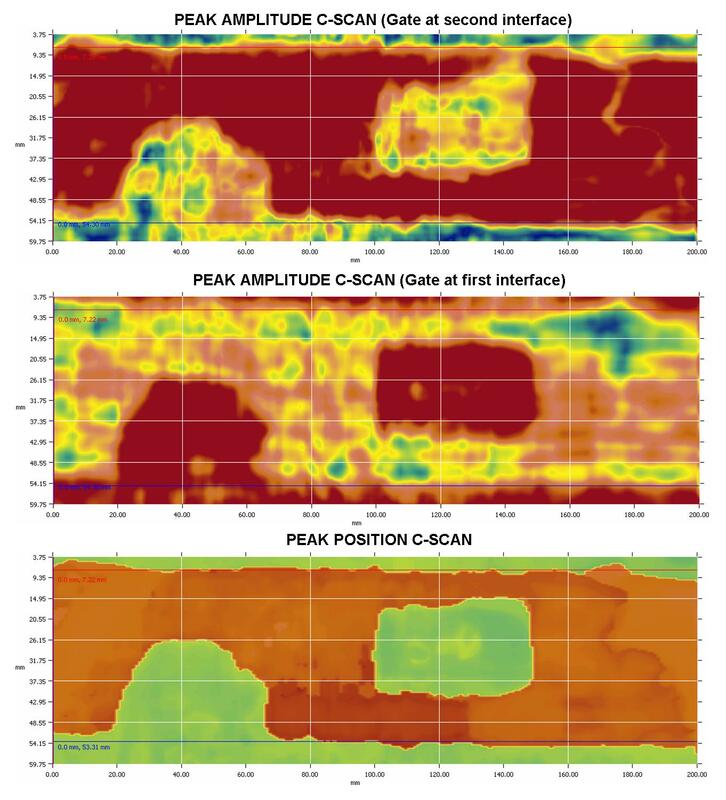 Figure 3 shows three C-SCANs obtained with different configuration: 1) Peak amplitude at first interface, 2) peak amplitude at second interface and 3) peak position. Although defects can be detected with any method, the last one achieves a resolution of about 1 mm in both directions then measuring defects size. Figure 3 – C-Scans obtained with different configurations. Beam focusing capability of phased array systems allows using higher frequencies when inspecting GFRP-Epoxy joints and so that, a much higher resolution can be achieved compared to traditional low frequency transducer. In this work, the feasibility of detecting and measuring adhesive lack defects in a strip bonded joint is demonstrated. Besides increasing inspection speed when compared with single-element transducers, phased array technique achieves, in this case, a resolution of 1 mm when measuring defects size.